In general, as consumers have become more educated about what they are feeding their dogs, they have come to expect more protein in dog food – and more protein from better sources. But is more protein always a good idea? At one time most dog foods were fairly similar in terms of their protein percentages. They tended to follow government recommended minimums for dogs. A few companies had some higher protein formulas (Purina Hi Protein and some other higher protein foods were available in the 1970s) but they still used the same kind of ingredients found in the other foods of the time and relied heavily on grains. If you wanted your dog to have more meat protein you could add some canned food (average quality or less) or meat from your own refrigerator. Today, of course, many dog foods have higher percentages of meat protein. The current recommended minimums for protein in dog food are 22 percent for growth and reproduction (puppies); and a mere 18 percent for adult dogs (AAFCO Table 3). Nearly all commercial dog foods have higher protein percentages than these figures. Many premium dog foods have 30 percent protein (DMB) or more. For most dogs, yes, more protein really is beneficial. According to one study, wolves have a protein-fat-carbohydrate profile of 54:45:1 percent by energy; while modern dogs have a profile of 30:63:7 percent by energy. Our modern dogs do not eat a diet like that of their wolf ancestors, but your dog won’t thrive if you feed him nothing but meat. However, a diet that’s high in meat protein is fine for most dogs unless they have a particular health problem that contraindicates high protein. Protein helps build lean muscle; makes the skin and coat healthy; heals wounds; and supports the immune system and central nervous system. If your dog doesn’t have enough protein in his diet, he can start to break down protein in his body to get what he needs which results in muscles wasting. Without enough protein the immune system suffers and a dog can be more susceptible to injury and stress. Modern dogs have evolved from their wolf ancestors and they are able to digest carbohydrates but dogs can still benefit from eating high protein diets. At one time people thought that high amounts of protein might lead to bone problems in puppies or cause older dogs to develop kidney disease. These beliefs have been disproven. Most dogs with kidney disease can benefit from eating a diet with moderate protein. Puppies may develop bone problems from too much calcium but not from too much protein. Today many grain free dog foods are particularly high in protein. Some of the protein comes from meat protein but often some of the protein comes from peas and lentils. Your dog can benefit from plant-sources of protein but dogs do not digest these sources of protein as well as animal-based sources. This was one of the complaints about using grains in dog foods – they are also a plant-based source of protein as well as a source of carbohydrates, just like legumes. Grain free dog foods that don’t use legumes typically use starchy carbohydrates such as potatoes, sweet potatoes, tapioca, and other carb sources. While some of these high protein foods may have lower carbohydrates than foods with grains, they can have their own dietary issues for dogs. If you look for foods that have more meat protein, they will generally have fewer carbohydrates, no matter the source of the carbs – whether it is peas and lentils, potatoes, or grains. However, many high protein dog foods are also high in fat. While fat is not all bad, especially for very active working dogs, it’s not good to see too much fat in a diet for most of our couch potato pets. If your dog is overweight or if he has problems digesting fat, look for dog foods that have slightly less fat but are still high in protein. You don’t have to choose a low calorie or weight control dog food. Just check the fat percentages (DMB) and opt for a food that has slightly less fat. Many people like Wellness CORE because it has slightly less fat while still providing high protein. In general, look for a dog food that has twice the protein percentage as the fat percentage. Older dogs can benefit from eating more protein, especially protein from good quality sources that are easy to digest. Many dog foods for older dogs are formulated with lower protein, along with lower fat and calories on the assumption that most older dogs are overweight. Yet many older dogs have trouble metabolizing nutrients as they age. Instead of reducing their protein percentages, they will do better with more protein to help keep their immune system strong and to prevent their muscles from wasting. Be careful in selecting dog food for your older dog, especially if he is not overweight. Don’t choose a food with lower calories unless he needs that kind of food. Look for a food with plenty of good protein regardless of whether the food has fewer calories or not. You can also feed puppies high protein diets as long as long as you are feeding a good puppy food or all life stage food. You do need to pay close attention to the calcium percentages when dealing with high protein foods and puppies. The calcium percentage needs to be 2 percent or less (DMB) for large breed puppies under six months of age. Large breed puppies, in particular, can grow very fast. They can be susceptible to skeletal and joint problems if they have too much calcium at a young age. If you are feeding a good dog food but the protein percentage is on the low side, you can increase the protein in your dog’s diet by adding meat, eggs, fish, or other sources of animal protein. There are also some good supplemental dog foods that are 95 percent meat. 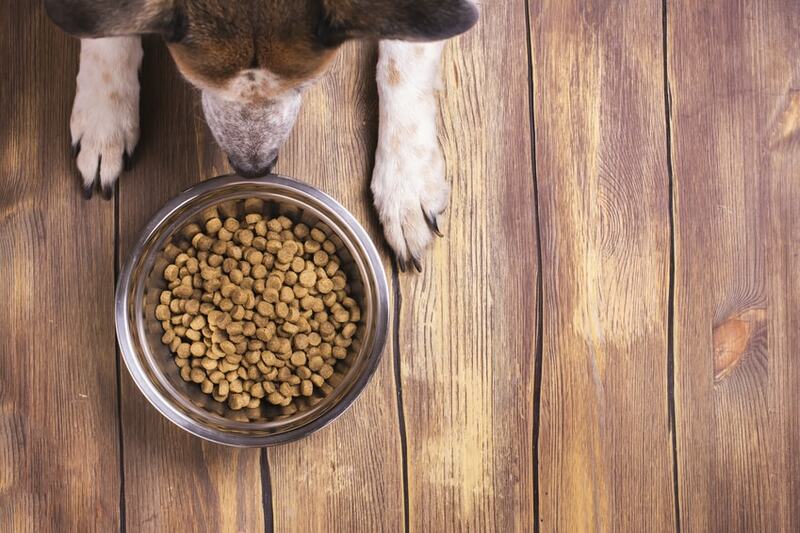 These foods are not sold as “complete and balanced” meals for dogs but they make excellent toppings for your dog’s dinner and add good protein to his diet. It’s important to remember that it’s not just the percentage of protein in your dog’s diet that matters. Your dog could eat a food with 40 percent protein but if the food is made up of low quality protein, your dog will not be able to digest it as well or obtain the nutrients from it. As already mentioned, many grain free dog foods today include large amounts of peas and lentils which are high in plant protein and not as easily digested as animal protein. In 2007 melamine was added to wheat gluten from China that was then (unknowingly) used in some pet foods. Melamine is an organic chemical that is normally used to make plastics. However, it is also a high nitrogen compound. This means that if it is illegally added to glutens or other food items, it makes those foods appear to have a higher protein content. (Ingredients are often tested for protein based on their nitrogen content.) This is just an example to show that not all proteins are the same. When choosing a high protein dog food, don’t just look at the percentages. Check the ingredients carefully. Some foods today probably do have more protein than dogs need. It is possible for dogs to become overweight by eating too much protein. Calories are calories, even if they come from protein. While some excess protein can be excreted in your dog’s urine, protein can also be stored as fat if your dog is using all the protein he needs in his diet. Protein metabolism also uses extra water in the body so a high protein diet can lead to dehydration unless you make sure your dog gets plenty of water. You may have noticed that many dogs drink more water when they are switched to a higher protein diet. Eating higher amounts of protein can also cause the body to expel more calcium which can weaken bones over time so it’s always important to keep an eye on the calcium levels in high protein dog foods. You probably won’t need to worry about most of these issues unless you are feeding your dog a very high protein diet. High protein is good for most dogs unless they have a specific health condition that indicates they should avoid eating too much protein. Many of the myths about dogs eating too much protein that people believed at one time (dogs and kidney problems, puppies and protein, old dogs) have been disproven. In general, the more meat protein a dog food contains, the fewer carbohydrates the food will have which is better for your dog.